The women’s road cycling calendar: why is 2017 such an unusual year? 2017 has been a fascinating year already for women’s cycling, and we’re only in April. We’re about to head into Ardennes Week, which signals the end of the Spring Classics, and already the season has been completely different to previous years. It really feels like this is the first year of a new chapter for the sport, where the women’s Classics have fallen in line with the men’s, and the old patterns – where one or two riders could dominate the entire Classics season – are over. I’m going to talk about why the changes have happened, and have a bit of context, because while there is a lot to celebrate, it raises a lot of questions about the future of women’s cycling, and how races and teams will adapt to the new Spring. After the racing year opened in Australia, the season had some major changes, with the loss of two pre-European-season stage races, the Ladies Tour of Qatar and the Vuelta a San Luis in Argentina. Qatar, especially, had been the first chance to see a lot of the new-season versions of teams, and a chance for staff and riders to spot any issues and iron them out, and for fans to make guesses about how the Classics could pan out. Without them, the first time we saw a lot of teams was Omloop het Nieuwsblad at the end of February. Team Sunweb is the dominant squad so far, but it’s only in the last fortnight that they’ve claimed that crown, and there are a lot more teams claiming victories this year than last. 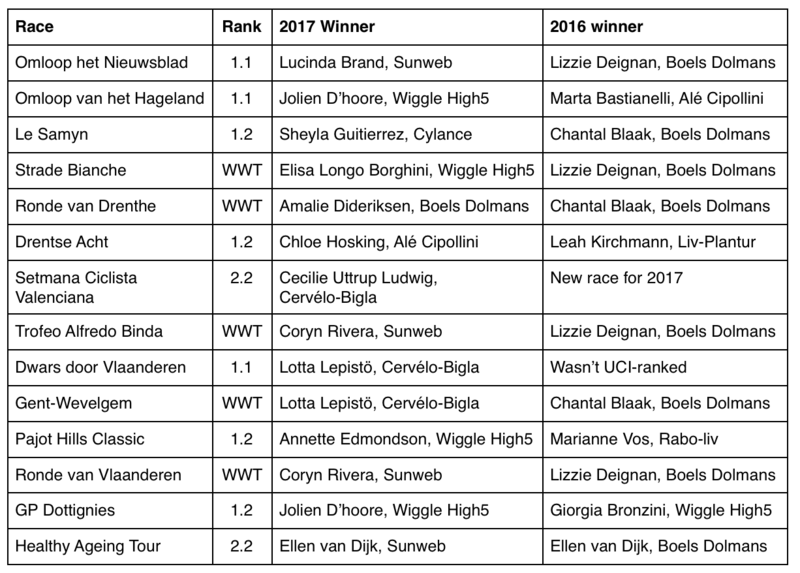 Compare this to 2016, when by this time, two Boels-Dolmans riders, Lizzie Deignan and Chantal Blaak, had won seven of the 12 UCI races: five WorldTour races, plus Het Nieuwsblad and Le Samyn, with Ellen van Dijk winning the Energiewacht Tour (this year’s Healthy Ageing Tour) and their riders also taking six other podium spots in the 11 day races. Now, that Boels year was an anomaly, but we’ve been used to seeing more dominant teams in the past, and not just in terms of the wins, either – the podiums have been spread around more teams this season, with more nations, and some great riders have already stepped up to get the biggest podiums of their careers. Until the Ronde van Vlaanderen, there had been a different winner in each of the 4 WorldTours and only one rider, Coryn Rivera, had been on the podium more than once, until her Flanders win made her the only rider to win two WorldTour races. So what’s going on? Why is the WorldTour so different from 2016? There are a number of reasons, and I’ll start with how 2017 is a different season to the previous years. Apart from losing the pre-season stage races, there have been two big changes that are effecting the racing – increasing race length, and adding more races. This year the UCI has increased the maximum length of women’s day races from 140km to 160km. This doesn’t sound like much, but it really makes a difference – especially when only a few races are using the extension. This is mostly a positive change, as it can be really hard to plan a good course in a shorter distance, factoring in start/finish towns, avoiding major infrastructure AND getting in good riding country, but it has potential to change how the Classics are raced, especially this year. As it’s the first year this has happened, riders and teams are still used to the previous lengths, and it’ll be interesting to see how, or if, this changes in the future, especially as even the WWT day races are wildly different, and riders have to plan training that takes in both the 70km races like La Course, and 153km races like the Ronde van Vlaanderen. This could be one reason why, in the previous WWT races, we’ve seen the peloton stick together for the first half of races where we’d expect more splits (although there are other reasons for this too, and I’ll come on to that tomorrow). It’s not something that can always be planned for in advance, however, as the races vary in when they publish the route details. Then we have the expansion of the number of races. This year, the Dwars door Vlaanderen became UCI-ranked for the first time, rather than a national-level race, making a cobbled mini-season of four Belgian Classics in ten days – Dwars door Vlaanderen, Gent-Wevelgem, Pajot Hills and the Ronde van Vlaanderen, with the GP Dottignies sprinters’ race on the day after RvV. For the first time, this is a block within the season, and it provides space for riders who like the cobbles and the short, sharp hills a chance to specialise. From the RvV, we went straight into the Healthy Ageing Tour, and then this week, it’s time for another mini-season, and another chance to specialise: Ardennes Week, and three opportunities for the climbing Classics riders. This is a huge deal. We’ve had Flèche Wallonne on the calendar since 1998, but adding the Amstel Gold Race (which had three previous editions, 2001-2003) and Liège-Bastogne-Liège, gives a full Ardennes Week for the women for the first time. It’s hard to tell, at this point, whether riders who haven’t been at their best so far are having a bad season, or peaking for the Ardennes. Every Dutch woman wants to win Amstel, and every climber would like to win the first Liège. Are riders like Marianne Vos, Lizzie Deignan, Pauline Ferrand-Prévot and Anna van der Breggen, who we haven’t really seen shine this Spring biding their time and aiming to peak for mid-April? Adding these new races means riders will be much more tired than usual, or have been skipping races. The season started with Omloop het Nieuwsblad, on 25th February, and then the first WorldTour, Strade Bianche, was a week later – so in the past six weeks there have been five WorldTour races, plus some important non-WWTs, and by the end of Ardennes Week, it will have been eight WorldTour Classics in eight weeks, up from six over eight weeks last year. Adding a few more races may not sound like much, but the Spring Classics have been slowly expanding over the last few years. In the last year of the Road World Cup, there were only four Spring Classics: Ronde van Drenthe, Trofeo Alfredo Binda, Ronde van Vlaanderen and Flèche Wallonne, and that year was the first time the women’s Strade Bianche was run – and when the World Cup morphed into the WorldTour in 2016, Strade stepped up to become part of it. Gent-Wevelgem also joined the WorldTour in 2016. It had previously been a lower-level race, running on the same day as Binda, with a reduced field as the biggest Classics stars were in Italy, but the UCI persuaded the Binda organisers to move their race, so that Gent-Wevelgem could take that step up, and from four World Cup Classics in 2015, there were now six in 2016. Adding two more this year means that the top Classics have effectively doubled in two years, from four in 2015 to eight this year, and along with Dwars door Vlaanderen, becoming UCI-ranked this year, we’re hearing that E3 Harelbeke might put on a women’s race, and there’s increasing pressure to have a women’s Paris-Roubaix. Going from four to eight major Classics might not sound like much, but it’s already having an impact. The Healthy Ageing Tour was missing some big-name teams in Wiggle High5, WM3 ProCycling and ORICA-Scott, while Annemiek van Vleuten, racing with the Netherlands National Team, pulled out after the second day, to focus on the Ardennes. Having full live TV coverage was a draw for the race, but in a world where it’s still difficult to find sponsors, not being able to guarantee a full roster of big teams and names can have a big impact. The choice will be whether to try to join the WorldTour, or re-position as a development race, and try to convince sponsors of the benefits. And while our unseasonably nice Spring has meant there have been fewer riders coming down with colds and the ‘flu, more races means more chances for injury – we’ve just heard that Cervélo-Bigla won’t be able to compete in both the Festival Elsy Jacobs and Tour de Yorkshire as planned, due to injuries. As always, I’d love to talk to you about all of this, so do leave me a comment below, or on twitter. I’m funded to spend time doing this kind of thing by my wonderful Patreon supporters. If you want to join them, for as little as $/£/€ 2 a month, I’d be very grateful – all the information about that is over here.